Eating out on Phi Phi combines the tropical tastes of Thailand, the cuisine of the Phi Phi Hotel resorts and locally run restaurants to give a really good selection of menus for the "foody", the Thai food savvy, the western pallet and those who just can't get enough of street food. 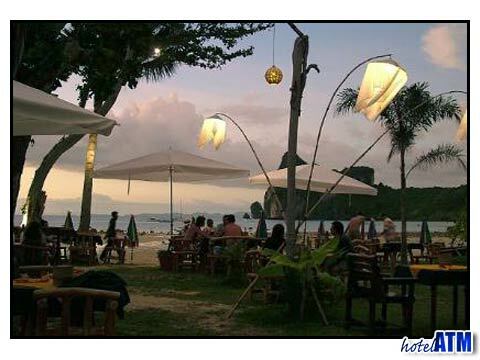 Eating out on Phi Phi can take you from a beachfront open air restaurants to the locally run restaurants serving Thai curries or elegant dining experiences promoting fusion cooking. The simple curry houses in near the market serve a host of local delicacies, especially the hot curries of the south and exotic seafood from the local fishermen. My favourite eating out on Phi Phi Island experience is at the 5 star boutique Zeavola Phi Phi Resort where you can dine in true style under the awnings with one of the best menus on the island. The Zeavola is in the north of Phi Phi Don so unless you are staying up at the Holiday Inn Phi Phi Island it might be far to go for an evening meal. However to go for a spa treatment and then slide down to the beach to the Baxil Restaurant might be a superb way to spend a day. Down by the village at the Phi Phi Banyan Villa you find the main seafood restaurant at the Tonsai Restaurant. Hear you can eat under the stars from the large selection of fish, giant prawn and lobster all served over rice or noodles and your favourite Thai curry or sauce. Simply mouth-watering. There are more seafood extravaganzas alongside the Tonsai Restaurant, and also out on to Phi Phi Don Chukit point as long as far as the Andaman Beach Resort. Heading back towards Tonsai cliffs the stylish restaurant at the Mama Beach Residence is a quiet oasis amongst the natural scenery. The Phi Phi Don Village is a mish mash of interconnecting walking streets that offer a great variety of eating out experiences. Here the cafe and bar culture mix with the local Thai restaurant, some catering to local tastes with their fiery geng som curry, Kanum chin, and other favourites and others aimed at the traveller and backpacking market. This latter group offers all the red, yellow and green curries alongside the so called snack dishes or holy basil and rice, chicken rice in informal settings, places where you can arrive off the beach and feel at home in a t-shirt and shorts. See the Cosmic Restaurant photos as an example of this style of eating out. If you like air con and prefer Chinese food, the 'Pakarang restaurant' of the Phi Phi Hotel has the best menu on the island however it doesn’t sell the Birds nest soup that the island is famous for. The birds nest are sent straight to the mainland sold to the Chinese concessions from Hong Kong and Taiwan. 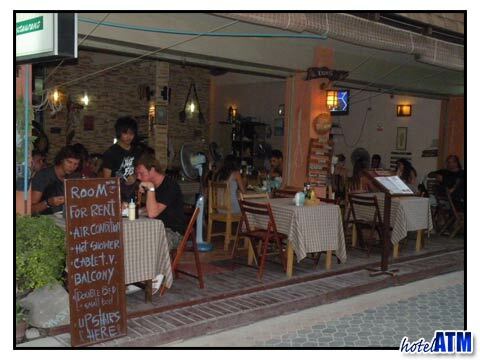 Two restaurants are worth mentioning when it comes to fine dining in Phi Phi Don Village. The Unnis serves a mixture of Asian and European dishes with a great upbeat flourish, some ambient back ground music and a screen showing a roaring fire! The Le Grand Blue offers an excellent French menu cleverly using the freshest local ingredients in a simple but well thought-out menu. Good wines. Both Unnis and Le Grand Blue serve excellent steaks. If you are just here for the day or need to take a meal before the afternoon ferry there are 2 interesting restaurants overlooking the pier. The Cancun bar is right on the Phi Phi Island Cabana Hotel side of the pier and sits on top of the longtail boat parking lot with views out over the bay onto the cliffs. Under the coconut trees it really steals a wonderful atmosphere. Amicos is housed on one of the original fisherman’s houses from pre tourism and opens out on to the beach and the main street through the village. Koh Phi Phi Restaurants and Restaurants Photos of Koh Phi Phi where you can find information on 'Trendy Restaurants', 'Amicos Restaurant', 'Calamaro Restaurant', 'Ciao Bella Restaurant', 'HC Andersen Restaurant', 'La Piazzetta', 'Matt's Joint', 'Patcharee Bakery', 'Pee Pee Bakery', 'Pluto's Italian Ice Cream', 'Steaks on Phi Phi', 'Restaurants on Phi Phi Island Overview' and more.